Bridal collections always capture the imagination of the little girl inside of us who dreams of a fairytale wedding. Bridal Fashion Week Spring 2013 happened in New York in the middle of October this year, and it is literally the finest in bridal couture with all the upcoming season's trends on the catwalk. We were absolutely WOWED by what was on offer this year - the trends that the designers showcased were just so gorgeous!! We've isolated some of the top trends from this year's collections to show you. The one-shoulder dress is one of the hottest trends this year - and we absolutely adore it!! Aren't these dresses above just so elegant? This trend is classic and almost Grecian in style. The first dress is a One-Shoulder Draped Column by Romona Keveza, and the others are by Amsale and Monique Lhuillier respectively. This is an up-and-coming trend, the lace appliqués or "illusion necklines". When it comes to classic, lace is still a frontrunner. This one shoulder draped tulle column with appliqué detail is by Marchesa. This style definitely isn't for everyone. But its fun, and lots of brides are choosing to wear shorter, flirtier dressers so designers included many sassy pieces in their collections. 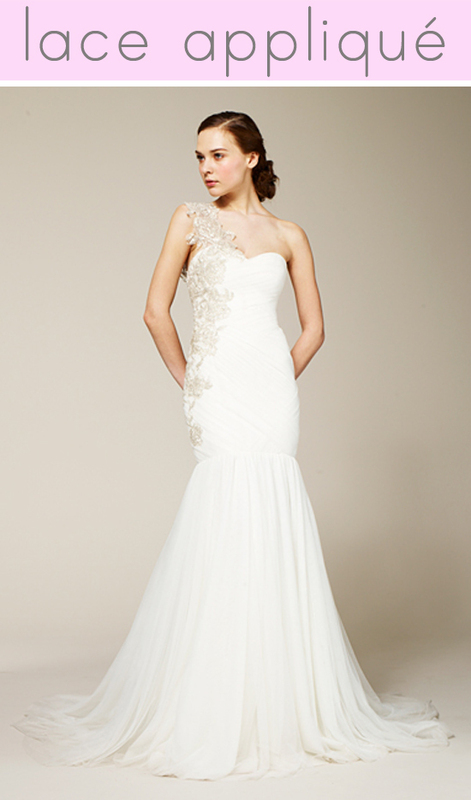 If you're looking to change at the reception, the convertible dress trend is perfect for you - like this Lazaro gown. Gold is the new white. Daring, modern brides are veering away from tradition and going for gorgeous metallic fabrics that are show-stopping. So, so pretty! This one-shoulder neckline with high slit in gold metallic is by Ines Di Santo. This year the runway was filled with a lot of short overskirts gracing the waistlines of longer gowns, in many shapes and cuts, materials and textures. These two gowns are by Amsale and Alvina Valenta respectively. We are crazy about these ruffled dresses! They are airy, ethereal and dramatic. The gowns above are by Amsale, Amsale and Oscar De La Renta respectively. The sheer look is a trend in fashion generally, and has made its way onto the bridal runways. The first dress is the epitome of ethereal beauty, a strapless piece with a sheer skirt overlay by Christos. 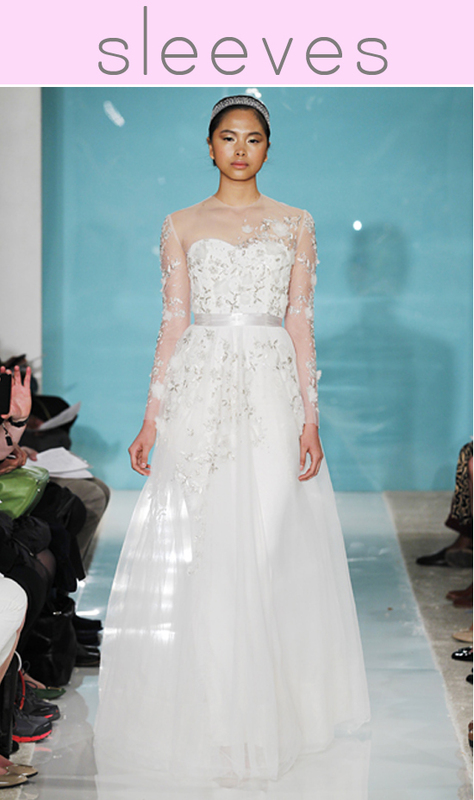 The second is "Fougere" Short Sleeve Gown Embroidered with Pearls, a crystal-studded illusion neckline by Reem Acra. While strapless dresses will always be queen of the bridal world, Kate Middleton turned that around with her princess wedding dress with sleeves. These sleeved gowns take sheer to the next level, and bring back vintage in a big way. 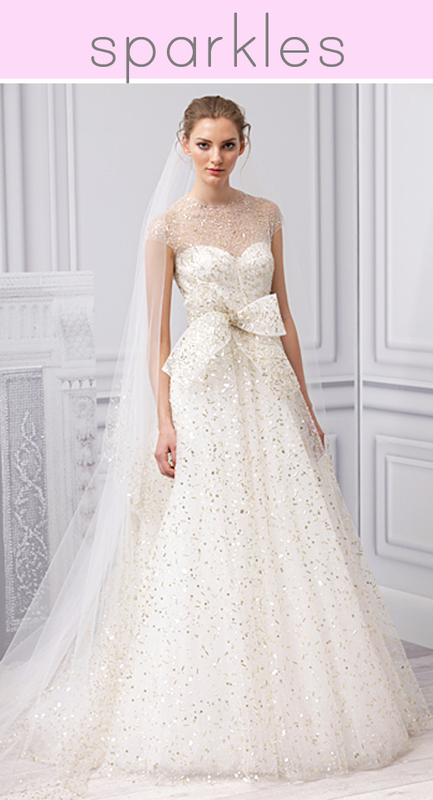 This "Alisier" Long-Sleeve Gown with All-Over Embroidery by Reem Acra is pure beauty. Fabrics covered in micro-crystals that create a shimmer of ice rocked the runways this year, and this type of dress is the perfect choice for a winter bride. "Champagne" Silk White and Gold Embroidered Illusion Gown by Monique Lhuillier is bubbly and flecked in gold elegance. We love how the crystals catch the light, and it is a modern look at a Cinderella princess dress. 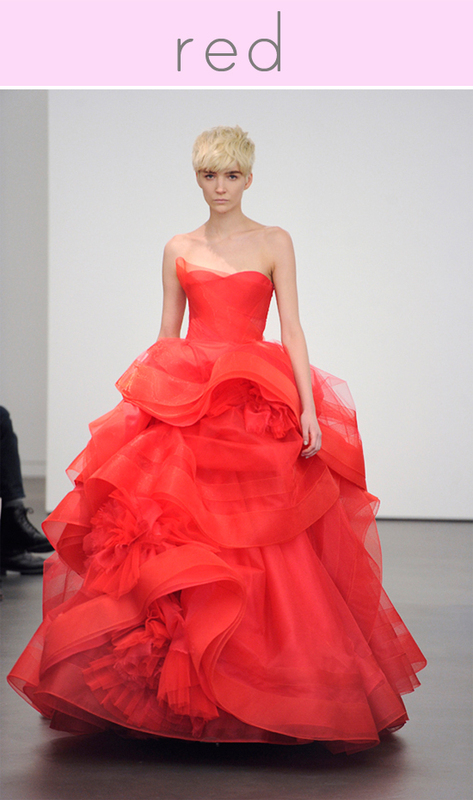 This gown was showcased by none other than Vera Wang, whose collection was dripping with the boldest red hues. She was inspired by the traditional Chinese wedding colour palette and celebration of love. While we're not so sure about the colour, isn't the dress just a delight? Image links can be found in the paragraphs above.